Sorry to post this. I did a search, but the first few I read were a bit more involved than my simple noob situation so I thought I'd ask this as a stepping stone to better understanding of LaunchBox (which so far seems to be one hell of a product). 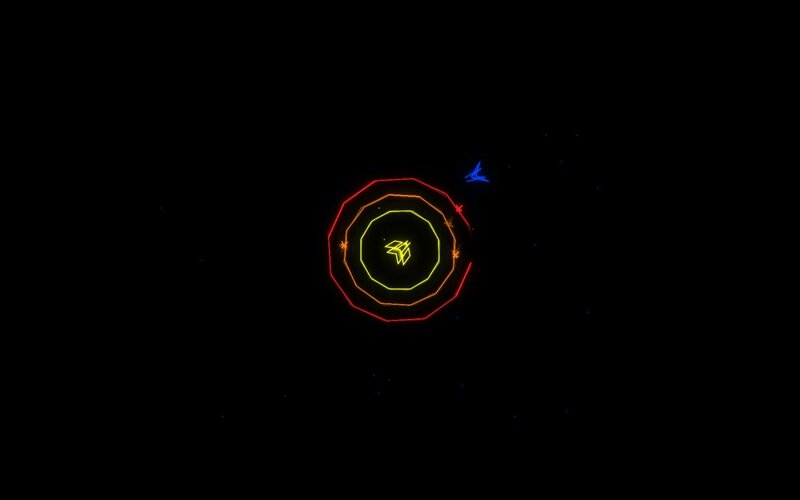 I just set up LaunchBox yesterday and really am only interested in using it mainly for MAME and then, mainly for only about 20-30 games from my youth (mid-50s). As such I have a very limited ROM set. I started by letting LaunchBox import the "full MAME catalog" which may not have been the best choice, but it gives me a great idea of what's going on. 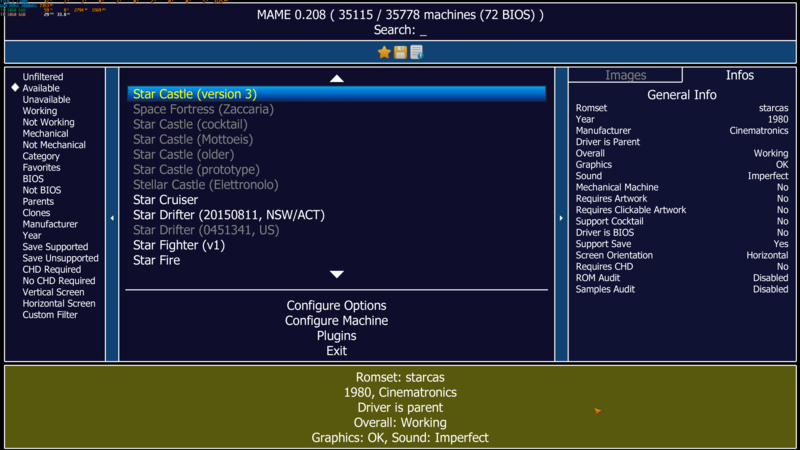 Anyway, one of the ROMs I have is for the old game Star Castle. The ROM is starcas.zip. The game doesn't appear in my list. I've tried scanning the folder a couple of times with no luck. What am I not understanding? Thanks again for any assistance and sorry for any redundancy in my question. I have a full romset and i do not have that game in Launchbox. Is it possible it went under another name also and that it needs a parent rom? OK i do have it in my roms folder and in MAME it says that it is working but with sound issues. However when i try to launch it from MAME it crashes to desktop. It loads and runs here, but ya.. no [built-in] sounds. 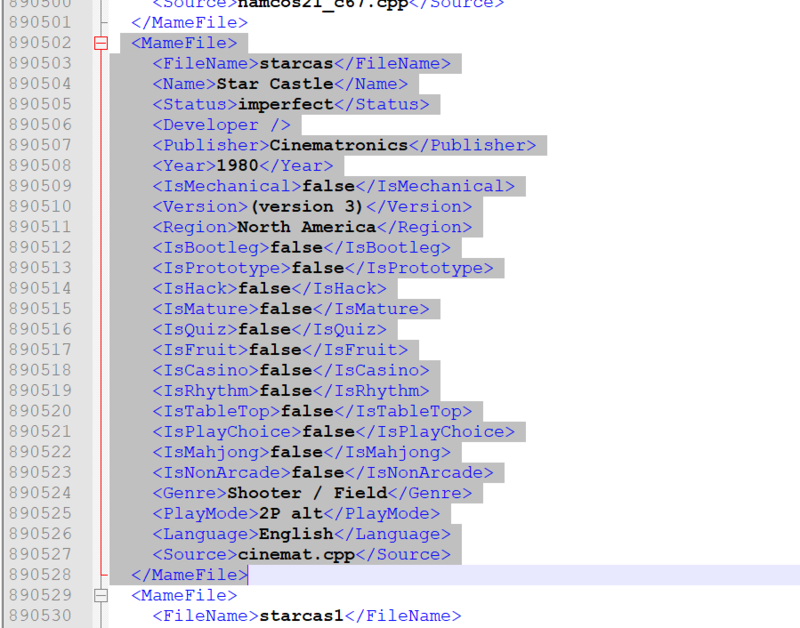 It is in the Launchbox MAME metadata.xml, but it is marked as "imperfect" rather than "working". I do know it works (or did work) as I used to play it all the time about a decade ago when I last was into MAME, including with sounds and an overlay. 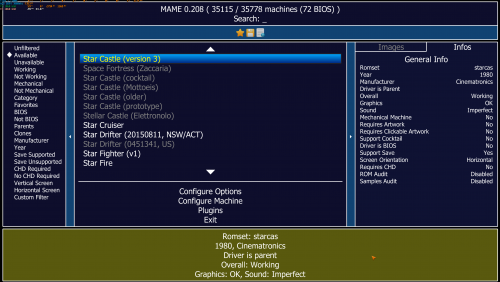 Place the zip in your MAME/samples directory and make sure the zip has the same name as the rom. To add the game to Launchbox select your arcade platform and go to Tools-Import-ROM files, click Next, click Add Files, navigate to the rom, select Use the files in their current location, deselect Skip games unplayable in MAME. Hopefully this should do the trick.